I recently visited Sheffield for the first time ever, to see some friends who moved there about a year ago. When I mentioned that I was going there to my friend from Scunthorpe, he nodded and said, "Sheffield's proper". Note that this has to be said with a northern accent for the meaning to be apparent. Proper, meaning sound / good / cool. If you say "Sheffield's proper" in a southern accent, it sounds like you're saying proper, meaning posh / well-mannered. Which wouldn't really be apt... It's much more interesting than that. Sheffield is of course famous for being the Steel City, booming in the Industrial Revolution as it supplied iron and steel products to the world. Stainless steel was developed here, the material which remains omnipresent in modern-day households. The prolific growth of the population and influx of wealth in the nineteenth century also gave the city some lovely Victorian public buildings. 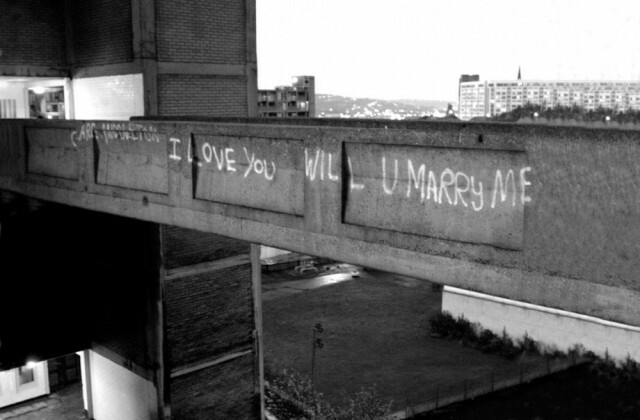 But no self-respecting architectural historian with a penchant for twentieth-century buildings could possibly visit Sheffield without taking in Park Hill, the infamous brutalist council estate housing. The intention for this complex was to improve the living conditions of Sheffield's impoverished post-war residents by transposing them from streets of run-down terraces to modern blocks rising upwards, re-housing old neighbours alongside each other in an ambition to retain the sense of community. However, the well-meaning concept of "streets in the sky" didn't really come off. This mammoth complex, built between 1957 and 1961, just fell into its own state of decay and notoriety, and according to many accounts, destroyed much of the old community that had previously existed. So, as a social concept, it pretty much failed... But it does form an awesome backdrop in many views around the city, towering above the train station. Why controversial? Well, some people just want it knocked down completely, some people think the restoration is over the top and fails to take account of the building's qualities and significance (it's a Grade II* listed building) ... and that's just the beginning of it. Far from being just an intellectual, architectural matter, the debate has many social and emotion facets for the people of Sheffield, with a great divide between those who love it and those who hate it. So what do I think about it? Well, architecturally, I think it's an incredible building - exciting, impressive, and a fabulous landmark. What do I think about the reality of what it became and what do I think about its restoration? 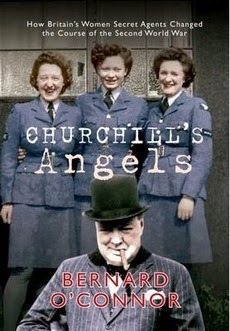 ... That, you will have to wait to hear, as I'm saving my treatise on it for another purpose. Yes, I am planning to start up another blog to run alongside this one - it will be my 'professional' blog, where this is my 'personal' blog. I intend to post links to my new blog here, so if you are interested in my architectural rants and want to learn some more about interesting buildings, you'll be able to check it out. Hopefully, I'll have the new blog up and running soon, and you'll be able to hear more about Park Hill, if you fancy it. As a born and bred Sheffielder, I'm actually a fan of the new Park Hill flats. Did you pass the King Edward VII school near the Botanical Gardens/Uni? That's my favourite, although they're massacring it with a 'revamp'. Lovely to hear from you! Interesting to hear your local perspective on the flats too. I didn't see the King Edward VII school, I'm afraid. I really only had one afternoon of wandering... I will have to remedy that and check it out next time I'm up there! This is such an interesting post. As a child I remember so may of these types of buildings that had been left over from the 60's and 70's and failed projects such as this. A lot of the high rise blocks in Liverpool have gone now but I love how Park Hill has become this dilapidated ghost of the past. I think it's a fascinating place, so beautiful. I'd love to explore it. "Dilapidated ghost of the past" - I like that. I would have loved to explore it more but I didn't have much time to spare and I was a little bit wary as I was on my own at that point, as my friends had gone off to work. I used to dislike all these 60s and 70s blocks but I've developed a fondness for them - not all of them, naturally, but some are wonderful. And I don't think it's just me - I think many more people are suddenly realising their value and that they shouldn't knock them all down! Future generations will be just as disappointed at our generation as we are of previous generations that knocked down so many Victorian lovelies! Great shots! Oddly enough I visited Sheffield for a friend's work party back in 2007, dead celebrities party. Good fun! I'll totally read your architecture blog! Excited to read your write up :). Thanks! And dead celebrities is always a winning theme... Glad to hear I have a supporter for my new blog - will definitely let you know when it's up and running. A very interesting post, and a broad selection of views! I'm intrigued by the interior of the church - especially its ceiling. Lovely light looking outside to the graveyard. 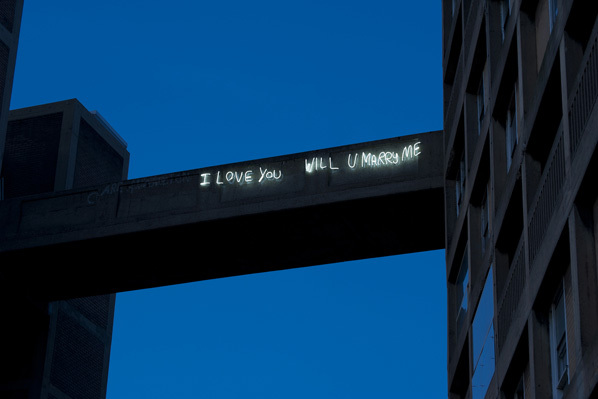 I love the mixture of grunge and tack in the luminous graffitied proposal. Love in a hard place. Great view along the meandering train line! Your various perspectives of Park Hill have kind of opened my eyes to its assets. Is that a "thing" at the moment - adding blocks of colour to old, block, concrete buildings? Something about it reminds me of a possible public housing estate/building I saw in Nottingham city. I'll be very interested to read your new blog, for sure. The inside of the church was amazing! I was completely blown away when I stepped in, particularly when I saw the great big Norman arch! There wasn't any indication from the outside to expect that inside, and it took my dating of the church back a couple of centuries! It was even better from the other side, but my photo wasn't so good. Plus, I was really struck by the roof too - when I looked it up when I got home, I found out that it re-used sixteenth-century timbers. And glad my pictures of Park Hill opened your eyes to some of its positives too! I think you're right that it's quite a "thing" to have blocks of colour like that. I'm not at all convinced by it, personally, particularly not in this instance. Interesting that you noted it in Nottingham too... And glad to hear that you'll be checking out my new blog, when it's up and running!